TRIP-aided multiphase steels are a new generation of low-alloy steels that exhibit a combination of enhanced strength and ductility, thus satisfying the requirements of automotive industry for good formable high-strength steels. As well known, cold forming of hot strip or cold rolled sheet is a standard step in the production, especially in the automotive industry. Conventional high strength steels (HSS) have been traditionally used by the automotive industry and these include C-Mn grades, dual phase (DP) steel and microalloyed grades called High Strength Low Alloy (HSLA) grades. These steels are produced by various combinations of processes and heat treatments, related to their chemical composition, and are found acceptable for many applications requiring superior formability, especially for tensile strength levels above 500 MPa. Today, many steel producers offer full spectrum of steels grades, with yield strength ranging from 250 MPa to 550 MPa, and tensile strength ranging from 340 MPa to 590 MPa. The development of steels during the last decade have shown that TRansformation Induced Plasticity (TRIP) steels constitute a new category of sheet or strip steels, in terms of their high strength and enhanced formability. Because of this increased formability, TRIP steels can be used to produce more complicated parts than other high strength steels, thus allowing the automotive engineer more freedom in parts design to optimize weight and structural performance. These excellent mechanical properties arise from a martensitic transformation of metastable retained austenite, induced by external stress and/or plastic deformation. The TRIP steels possess a multi-phase microstructure, consisting typically of ferrite (α-Fe), bainite and retained (metastable) austenite (γ-Fe). 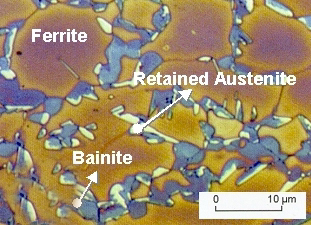 The microstructure is formed after intercritical annealing and a subsequent isothermal annealing in the bainitic transformation region, called austempering. 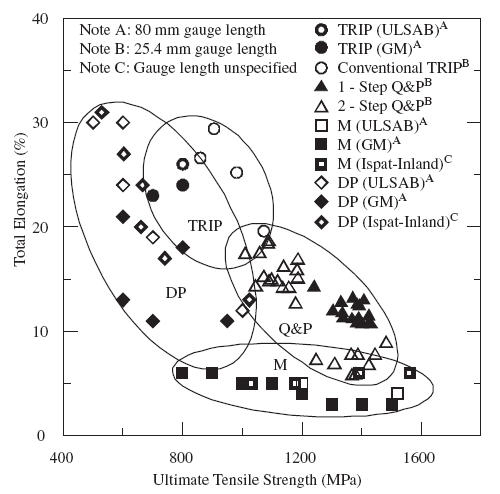 The various levels of these phases give TRIP steels their unique balance of properties. The carbon content in austenite is increased both during the intercritical annealing and during the austempering. The carbon enrichment during austempering is the result of the suppression of the formation of carbides during the bainitic transformation, due to the presence of the alloying elements such as aluminum and silicon. The enrichment of carbon in the austenite increases its thermal stability and consequently, the austenite can be retained upon cooling to room temperature. Figure 1 shows the typical TRIP steel microstructure. Like Dual Phase DP steels, the microstructure of TRIP steels is comprised of mainly soft ferrite. While DP steels have a microstructure with islands of hard martensite dispersed throughout, TRIP steels have a combination ferrite (α-Fe), bainite and retained (metastable) austenite (γ-Fe). Comparing a yield strength levels, the HSLA steels, DP steels and TRIP steels have yield strength of about 350 MPa (50 KSi). 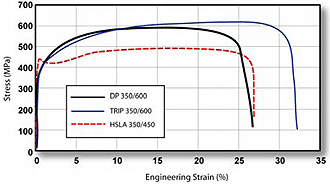 Figure 2 shows the stress-strain curves for a HSLA steel, a DP steel and a TRIP steel. As shown in Figure 2, each of the steel grades has yield strength of about 350 MPa (50KSI). Figure 2: The stress-strain curves for HSLA, DP and TRIP steels. Because carbon-enriched metastable retained austenite is considered as beneficial for TRIP steels, a new concept of quenching and partitioning (Q&P) is developed recently for predicting the amount of retained austenite. This concept involves quenching austenite below the martensite-start temperature. The examination carried on the 0.19% C, 1.96% Al, 1.46% Mn steel showed that substantial amounts of austenite could be obtained via Q&P processing, with measured retained austenite fractions similar to the predicted maximum of 15%. New microstructure that extends the strength levels of current TRIP steels resulted from Q&P processing, as shown on Figure 3, which displays comparison between measured strength and formability of dual-phase (ferrite-martensite), austempered TRIP (bainite) and martensitic steels. TRIP steels can be engineered or tailored to provide excellent formability for manufacturing complex parts. In addition, these steels can be used for the automotive body structure to provide excellent crash energy absorption. This entry was posted in Automotive, High Strength Steels, Mechanical properties, Stress-Strain. Bookmark the permalink.